Engineering College Admission Test (ECAT) is necessary to get admissions in public and private sector engineering universities and Colleges of Pakistan. 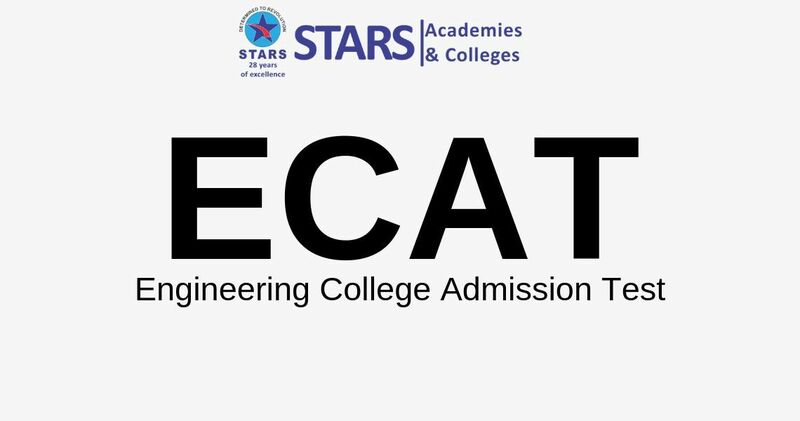 ECAT is the best testing tool for engineering students in Pakistan who need to student in engineering university he / she had too passed the Ecat test with good Marks. All the candidates who are planning to get admission in Engineering colleges and universities are required to pass this Ecat test. The syllabus of ECAT consists of four subjects which includes Mathematics, Chemistry, Physics and English of F.Sc, Pre-Engineering or equivalent level. The candidates who have appeared or passed in the Intermediate, BSc, DAE, B.Tech (pass) or any equivalent examination are eligible to apply for the ecat test. The combinations are Mathematics, Physics, English & Chemistry and eligibility criteria is F.Sc. (Pre-Eng) or Equivalent Examination/ B.Sc/Applicable DAE/B.Tech (Pass) with Minimum OF 60% Marks in Exams. With combination of Mathematics, Physics, English & Computer Science the eligibility criteria are ICS with Minimum OF 60% Marks. With combination of Mathematics, Physics, English & Statistics, eligibility criteria is F.Sc. with Physics, Mathematics & Statistics with Minimum OF 60% Marks in Exams. ECAT is basically a subject test. It includes Mathematics, Physics, Computer or, Chemistry and English. The number of questions and weight of the test and sections vary considerably in test. The test is conducted to evaluate the knowledge of the students. However, it is not based on a prescribed course outline. ECAT is engineering college admission test that is very necessary to pass and to get admission in any engineering university or college. What is Application process for ECAT test? Is there any negative marking in the ECAT entry test? There are 30 MCQs of Chemistry, 30 MCQs of Physics, 30MCQs of Mathematics and 10 MCQs of English. There are 4 marks of each correct MCQ while –1(negative) marks for wrong answer. Please attempt those MCQs which you have Confirmed. What is the format of ECAT test? Physics, Chemistry, Mathematics, and English are the sections in a standard and Major Subjects for ECAT format. However; English contents differ from university to university it is also a major subject. For example, the ECAT test format for UET Lahore is different than that of NUST and LUMS ECAT test format. I am a Foreign Pakistani. Can I apply for admission against seats reserved for foreign candidates? Hello Candidate, if you are applying against reserved seats for the Children of Overseas Pakistanis then you have to submit the documents that are given below. An employment certificate (on Form-VIII) of Parents or a Guardian of candidate in a foreign country issue by the Pakistani Embassy. Form-VIII can be downloaded from our website or can be obtained from the undersigned Office. A photocopy of resident visa of the Parent/Guardian of applicant that is attested by the Pakistani Embassy in that country so, you can apply for ECAT Test. How can I get prospectus and admission form? I have done 12th Grade or A-level. How can I get my equivalence? You don’t Have to Worried Stars Academy Lahore Iqbal Town is here for help you. The candidates having equivalent foreign qualifications (for example A-levels) must obtain Equivalence Certificate from I.B.C.C. so, you can easily apply ECAT Test. What are the documents required to apply for the admission? Domicile certificate along with photograph. Original Computerized National Identity Card (CNIC) or original Computerized B-form from NADRA. The candidates who has having equivalent foreign qualifications (for example A-levels) must attain equivalent Certificate from I.B.C.C. What is the validity period of Entrance Test scores? ECAT test scores are only valid for the session in which you have appeared. Once you have appeared in ECAT Test you can apply for that particular session and admissions in universities only. ECAT test syllabus consists of Physics, Math’s, Chemistry, and English parts. There are 30 MCQs of Chemistry, 30 MCQs of Physics, 30MCQs of Mathematics and 10 MCQs of English. There are 4 marks of each correct MCQ while –1(negative) marks for wrong answer so, Please Condidiate only Mark those MCQ's which they are Confirmed. Which organization carries out these admissions? UET (University of Engineering and Technology), NUST are the organizational bodies to conduct ECAT Test. When does the admission process starts? Admission process for ECAT Test starts right after the intermediate examination in July. What is the eligibility criterion for admission of Ecat Test? The candidates of ECAT Test, who have passed or appeared in the Intermediate, BSc, DAE, B.Tech (pass) or any equivalent examination are eligible to apply for the ECAT test. Where should I contact for any information? All Engineering University Details of Ecat Test 2019 & Fees Structure. The ECAT Test of NUST University is of two types, i.e. computer based Test and paper based Test. Computer based paper Test is conducted in Islamabad, whereas, the paper based Test is held in Karachi and Quetta Cities. This NET is taken in three type of series. For the first registration forms are made available in month of November 2019 on their official sites while the exam is taken during December 2019. During February the registration for the second series opens while the test is conducted in the last days of March and a start of April 2019. The ECAT test for the third series of 2019 will be organized in July 2019. Applicants could apply for the test from 28th May, 2019 to 30th June, 2019. The fee for the exam is PKR 3000 to 3500. ECAT Test for FAST or National University of Computer and Emerging Sciences will be conducted on 10th July 2019. The forms will be made available on 2nd July 2019. Students will have only four days (2nd to 6th) to submit form. PKR 1000 is the fee for this exam.